But some people disagree and believe that avoiding minutia ingredients like honey can harm the vegan movement by appearing too rigid or difficult. So, who’s right? Does the cultivation of honey and bee products hurt animals? What about the environment? Are bees animals? Are vegans just being extreme? Let’s find out. Honey and veganism is a big topic, but there are a few questions that come up more than others. Here are some answers to the most commonly asked ones. Are you serious? Are you trying to say we should care about insects? That makes vegans look extreme. Some well-intentioned vegans overlook the use of honey because of the widely spread myth that honey and bee products are all-natural by-products of the necessary pollination of our food crops. 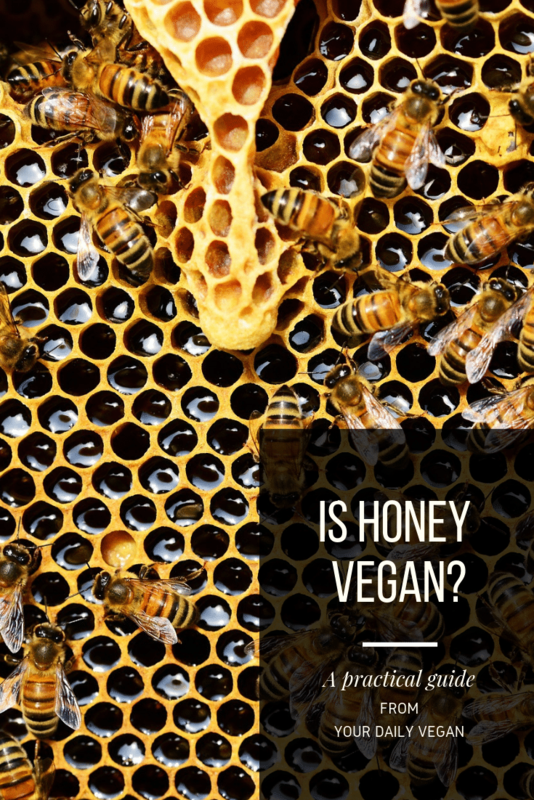 Some vegan bloggers and organizations have made matters more confusing by claiming that only extreme vegans avoid honey. The truth is, consuming honey is not only detrimental to bees, but it also’s damaging to the environment and has dangerous consequences for our food supply. And honey is tested on animals such as cats and dogs, among others. Sure, it may seem extreme to avoid products made from insects. But offering respect to the littlest members of our world seems logical when thinking about caring for those who are perceived inconsequential or weaker than ourselves. We can avoid honey and bee products for our survival. So, we should. Don't bees pollinate crops? Aren't they good for the environment? The first thing you should know about honeybees is that they aren’t native to North America. Honeybees come from an ancient lineage of cavity-nesting bees that arrived from Asia around 300,000 years ago and rapidly spread across Europe and Africa. (1) They came to North America sometime in the 1600s. So, how did food crops get pollinated before the arrival of honeybees? From the keystone pollinators. Keystone pollinators are pollinators who are essential to the survival of an ecosystem. In North America, the indigenous pollinators are birds, butterflies, insects, and native wild bees among others. There is a significant adverse impact on keystone pollinator populations from honeybees through crowding and stealing of pollen and nectar that would otherwise be available to them. Wild pollinators are in decline across many parts of the world. Because of the downturn, managed honeybees and bumblebees are frequently shipped to the United States to provide pollination services. But doing this poses dangerous risks to the wild bee population. One problem is that many countries have inadequate or no laws for bee movements. The globalized trade in bees has enabled almost free-movement of diseases around the world. Sadly, even if infections in managed colonies disappear, other problems arise. Resistant organisms, mites (varroa mites specifically) quickly develop a resistance to the pesticides used to control them. The varroa mite is commonly thought to be a significant contributor to colony collapse, as are insecticides and monoculture crops. Another important environmental factor to consider: most countries import honey. According to estimates, 42% comes from Argentina, China, Mexico, Canada, and India. About 85% in the UK comes from Vietnam, China, Mexico, Australia, and Argentina. While Germany, the world’s largest importer of honey, gets theirs from Argentina, China, and Mexico. Managed honeybees do pollinate plants but are not helpful to the environment because they crowd out and bring disease to native keystone pollinators. Also, they use precious resources in both the transportation of the finished products and the transportation of managed bee colonies as well. Isn't Honey - or Pollen - or Royal Jelly - Healthy? Even if honey were the healthiest food on the planet, there is still no reason for a vegan to consume it. As it is though, honey as food falls into the “use sparingly” category of the food pyramid. It’s sugar with no complex carbohydrates or amino acids and virtually no nutritional value. 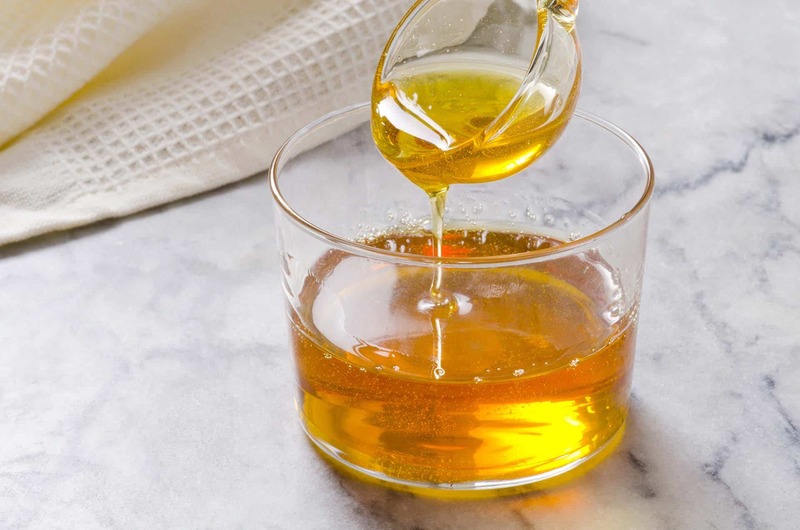 Honey does contain “small amounts of vitamins and minerals, including niacin, riboflavin, pantothenic acid, calcium, copper, iron, magnesium, manganese, phosphorus, potassium, and zinc” according to the National Honey Board. Unfortunately, the heating and filtering process can be destructive. While this does not eliminate all enzymes, it does reduce the number left after processing. Regardless, while proper nutrition is important, it doesn’t play a role in veganism as an ethical philosophy. After all, how many times have we heard that eating animals is vital to good health? Hundreds? Thousands? What about free-range, local, or organic honey? It would take a great deal of work to obtain real, truly free range, local, and organic honey. First, you’d have to head into the woods to find a hive made by native bees. Good luck with that. Native bee colonies are scarce and hard to find. Next, if you do happen to find a native colony, removing the honey won’t be easy. Attempting to take it from the hive would destroy it. Hives are delicate and intricate and not sized for human hands. Oh, and you’d get stung because bees don’t willingly give up the food that they work hard for and need to survive. See the honey alternative and beeswax alternatives section for everything you need. If you've given up honey, shouldn't you also be giving up anything that has been pollinated by honeybees? Nope. Bees are accidental pollinators. The only thing they care about is collecting pollen and nectar for their young. As bees move about collecting what they need, pollen sticks to their hairy bodies. Then it’s rubbed off onto other flowers. Eventually, it makes it the pistol of the plant where seed-production gets started. In this way, the pollination is entirely by accident. The bee does nothing to make it happen. Since pollination occurs as a result of the natural behavior of bees, the answer to the question is simple. No, there are no ethical implications for eating food pollinated by bees. That is, as a concept. Today’s industrial pollinators spend much of their lives in the back of 18-wheelers, subsisting on high-fructose corn syrup while being shlepped back and forth across the country to pollinate acres upon acres of monoculture crops. This raises ethical questions for vegans, as well as non-vegans, to consider. All animals rely on plants for survival- directly or indirectly, and our food supply is dependent upon the pollination of our crops. The first step to addressing this concern is to eliminate the consumption of honey and bee products, thereby reducing the number of managed bee colonies in existence. The next step needs to be addressing the acres and acres of monoculture crops by moving towards a plant-based diet. This would eliminate the need to grow millions of pounds of corn and soy to feed to animals, thereby allowing farmers to grow more diverse crops which keystone pollinators could then pollinate. Obviously, this is a monumental task and won’t happen overnight. But eliminating honey and bee products from the equation is the first, crucial step. There is a difference in the suffering of bees compared to other animals so honey isn't a big deal. You’d be surprised how often this comes up when discussing honey and veganism. Someone who eats honey but avoids eggs is assuming that the pain, suffering, and human dominance experienced by a bee counts less than the pain experienced by a chicken. In reality, the only difference is the size of the animal. The thing to remember is that veganism is an ethical philosophy. It begins with the idea that humans do not have the right to use animals in any way and that our use of animals is unnecessary and exploitative. This ethical stance means we should avoid, to the extent that it is practical and possible, all forms of exploitation and human dominance. Listen, if you ask a large group of people about whether or not we should consume honey or bee products, you’ll receive a variety of answers. You’ll hear that some vegans avoid honey, while others do not. Not true. A vegan will avoid it because it comes from bees similar to how dairy products come from cows. Also, you’ll see articles stating that people who avoid honey make the entire vegan concept unworkable or unfeasible for most people. Honey isn’t some magical ingredient no one can avoid. It’s an animal product that has been mass marketed and mass manufactured for generations. Plus, it’s tested on animals. With so many vegan alternatives available, honey is not only exploitative, it’s unnecessary. If you were to ask, most people would be able to tell you that a dog is an animal. There’d be no debate about it. But should you ask the same people if a bee is an animal, you’ll hear a variety of answers. A lot of them incorrect. A bee is an insect. Are insects animals? Yes, absolutely. Bees are flying insects related to wasps and ants. There are nearly 20,000 known species of bees on every continent except Antartica. Insects are a class of invertebrates within the arthropod phylum that have a chitinous exoskeleton or outer covering, a three-part body (head, thorax, and abdomen), three pairs of jointed legs, compound eyes, and one pair of antennae. Insects play a vital role in our ecosystem which includes many functions such as soil turning and aeration, dung burial, pest control, wildlife nutrition, and pollination. Take beetles for example. Beetles are scavengers who feed on dead animals, fallen trees, and other decaying matter. By doing so, they recycle biological materials creating the rich topsoil our crops need to thrive. Insects, like butterflies, are also food for larger animals. Not only that, some insects feed on other insects who are damaging to crops. Ladybugs feed on aphids, for instance. Finally, of course, insects such as wasps, bees, butterflies, and ants are pollinators of flowering plants. As an aside: Birds are perhaps the most visible predator of insects, but they aren’t the only one. Ants and even insects themselves account for the vast majority of insect consumption. Without predators to keep these populations in check, insects could undergo an almost unstoppable population explosion. Is a honey bee an animal? The short answer is yes; insects are animals. Vital, important animals and some of the most diverse group on the planet, including more than a million described species, insects represent more than half of all known living organisms. Is honey bee barf? Let’s find out. Honey bees fly from their hive to collect pollen, propolis — a resinous mixture collected from tree buds, sap flows, or other botanical sources used as a sealant for unwanted open spaces in the hives — and nectar. It is the nectar that is used to make honey. Nectar is extracted from flowers using a bee’s long, tube-shaped tongue and stored in its “honey stomach,” or crop. Bees have two stomachs; the crop or honey stomach, and a stomach used for eating. When full, the crop weighs almost as much as the bee does. During the flight back to the hive, bees secrete enzymes that transform the chemical composition and pH of the nectar, making it more suitable for long-term storage. Once the forager bee returns to the hive, she will regurgitate the contents of the honey stomach, a process called trophallaxis, and pass it on to a house bee. The house bee will then process the nectar internally by chewing the nectar, adding more enzymes to break the complex sugars in the nectar into simple sugars. Then, the nectar is placed into the beeswax cells. Initially, the nectar collected and stored still contains a high water content. The bees will begin to dehumidify the nectar by fanning it with their wings. This process removes most of the moisture from the nectar, turning it into thick syrupy honey. Bees store pollen and honey during the active summer period. This cache of food stored in the honeycombs is what the bees survive on during times when the hive cannot forage for flower blossoms, such as in winter months. Is Honey Bee Vomit or Poop? Believe it or not, this question comes up again and again. The answer to both is no; bee vomit is closer maybe, but still not right. Nectar collected by bees is passed mouth-to-mouth from bee to bee through a process called trophallaxis until it reduces in moisture content and turns into honey. So, honey is not technically bee vomit, but it does come from bees passing nectar between themselves. If you’ve never thought about beekeeping before, you’re not alone; many people don’t. 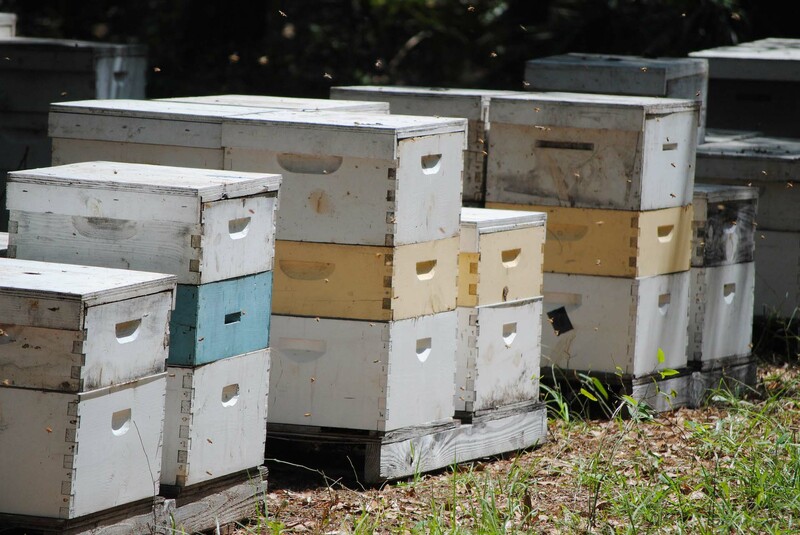 For this guide, there are two styles of beekeeping: commercial and backyard hobbyists. Instead of oversimplifying and making sweeping statements about each, this section will focus on the practices that regularly occur in beekeeping and why they make honey not vegan. It’s unfortunate but true; beekeeping often tends to be overlooked as an exploitative practice. One reason for this may be because people have little idea that bees a part of the animal husbandry industry much like cows are. Beekeepers hate when I say that, but it’s well-documented. Whether in a commercial setting or an idyllic backyard environment, raising bees for honey requires many of the same practices. The following practices that regularly occur in managed bee colonies, both commercial and hobbyist setups. 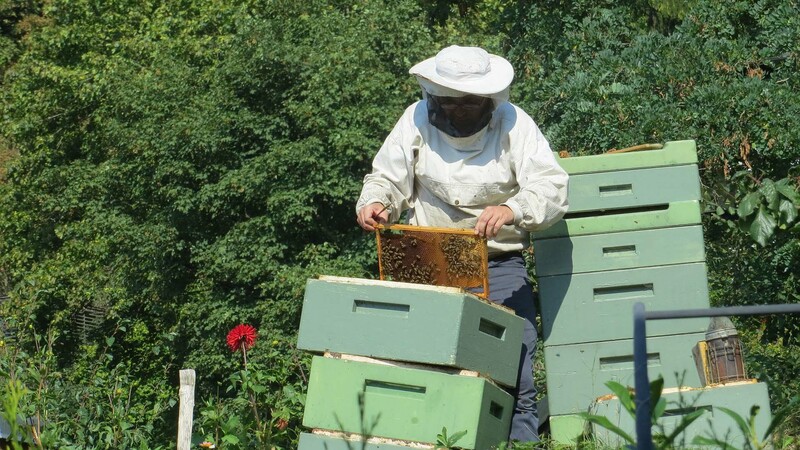 Not every beekeeper may use every method, but every technique listed is conventional within the industry. Bees make and store honey during the active months. This cache of food stored inside the honeycomb is what bees survive on during times when the hive cannot forage for flower blossoms, like in the winter months. Some beekeepers take the honey once the worker bees finish capping it, leaving the hive without the winter store it needs. Instead, it’s common practice for beekeepers to feed their bees nectar-replacements such as dry sugar, sugar water, pollen patties, and high fructose corn syrup, which isn’t the best for bees, maybe. There are five products most commonly harvested from bees: Honey, pollen, beeswax, propolis, and royal jelly. Honey is their primary food source, and there is no benefit to the bees when we take it, primarily if replaced with inferior human-made sugar mixtures. Pollen is another source of food taken that, again, has no advantage to the bees when we remove it. Together with taking their food, beekeepers will take beeswax when harvesting honey. The process begins by collecting the entire comb structure and melting it down, then straining the wax out. Propolis — the sticky glue bees use for construction and medicinal purposes — might also be taken. And then there’s royal jelly. First, to collect it, the queen is removed from a group of young bees. This removal stimulates the young bees into making new queens. Next, each new queen larvae dines on a small amount of royal jelly. Finally, the beekeeper kills the queen larvae, and the royal jelly removed. In each of these cases, bees worked tirelessly to create these products and need them for their survival. By contrast, we don’t. Beekeepers typically kill queen bees every one to three years and replace them with new. In unmanaged hives, bees would decide if and when to remove the queen themselves. In addition to these deliberate deaths, during honey harvesting and collection even the kindest and most gentle beekeeper will unintentionally injure, crush, or kill some bees. It’s unavoidable. In either situation, bees can (and do) die. Did you know that honey and bee products account for only a small percentage of the total bee economy in the United States? The most significant portion comes from the rental of managed colonies to farmers to pollinate fruit and vegetable crops. So, how did food crops get pollinated before the arrival of honeybees? The answer is native, or keystone, pollinators. Keystone pollinators are native pollinators who are vital to the survival of an ecosystem. The broad variety of native pollinators includes more than 3,500 species of bees (many of which are solitary), moths and beetles, and other animals such as bats and birds. (23) There is an adverse impact on keystone and native pollinator populations from honeybees through crowding and stealing of pollen and nectar that would otherwise be available to them. Wild pollinators are in decline in many parts of the world. Because of the downturn, managed honeybees and bumblebees are frequently shipped to the United States to provide pollination services. But doing this poses dangerous risks to the wild bee population. Sadly, even if infections in managed colonies disappear, other problems arise. Resistant organisms, mites (varroa mites specifically) quickly develop a resistance to the pesticides used to control them. The varroa mite is commonly thought to be a significant contributor to colony collapse, as are insecticides and monoculture crops. Not only that, there’s the impact on the environment from transporting managed colonies back and forth across the United States alone pollinating crops. 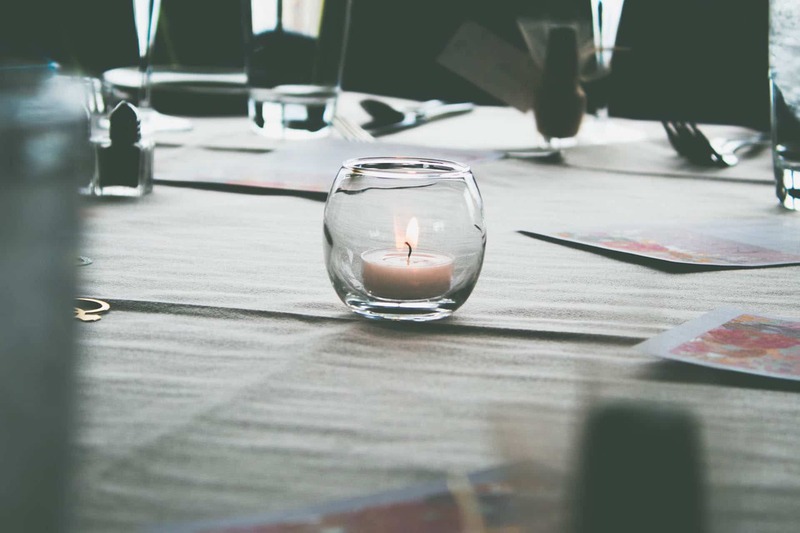 This practice raises ethical questions for both vegans and non-vegans alike. Seeing, all animals rely on plants for survival, directly or indirectly, and our food supply is dependent upon the pollination of crops. Changing our world to benefit wild pollinators is part of the solution. Eliminating the demand for honey and bee products is the first step to take. In doing so, it would prevent millions of bees being bred and managed to produce honey and by-products which would reduce the transmission of disease, and allow native pollinators to return to areas where managed populations have taken control. Why Don’t Vegans Eat Honey? Whether in a commercial setting or an idyllic backyard environment, raising bees for honey require many of the same practices of interference and manipulation used in farming (other) animals for food. That reason alone is enough to make it off-limits to vegans, but there are also environmental and ethical issues surrounding its production too. Vegans don’t eat it because honey is an animal product made by animals. One little-known fact about honey is that it’s tested on animals. Sadly, animals are dying to determine the effects honey has on human health. Typically, these tests are performed on animals such as mice, rats, and rabbits but have also been known to include cattle, sheep, goats, horses, donkeys, and even feral cats and dogs. Read the in-depth examination in the article, If You Eat Honey, Read This. Of all the critical factors to consider when examining honey and bee products, animal testing is the most heinous and needless. Honey has a reputation for being good for us, but is it true? 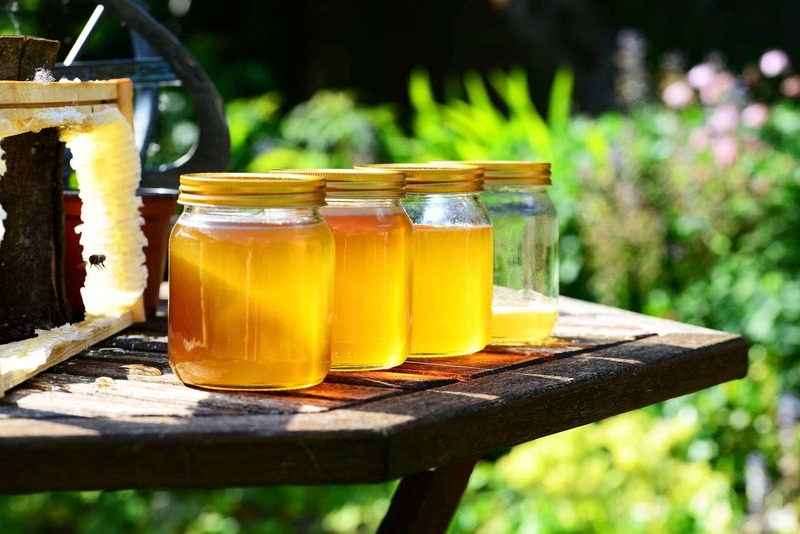 Let’s look at some of honey’s best-known and popular purported health benefits; whether confirmed by science or passed down through folk traditions or a mother who heard it from their mother’s mother. With its bonanza of purported healing properties, honey and bee products have been used for millennia as a medicinal remedy for a plethora of ailments. The ancient Egyptians used it, as did the Greeks, Romans, and some other cultures. What I’m saying is, honey has history, and with good reason too. When examined, honey does contain an unusual chemical makeup. It is low in moisture and extremely acidic, an environment that bacteria and microorganisms can not grow in but which keeps honey from spoiling almost indefinitely. Bees add an enzyme, glucose oxidase, to it that creates hydrogen peroxide as a by-product. Also, there have been animal studies done on the efficacy of honey and bee products used for medicinal purposes that have had varying degrees of success. Even if honey were the healthiest food on the planet, there is still no reason for a vegan to consume it. Honey, as a food, falls into the “use sparingly” category on a traditional food pyramid. In basic terms, it is just sugar with no complex carbohydrates or amino acids and virtually no nutritional value. According to the National Honey Board, honey contains “small amounts of vitamins and minerals, including niacin, riboflavin, pantothenic acid, calcium, copper, iron, magnesium, manganese, phosphorus, potassium, and zinc.” (30) However, heating and filtering honey is a destructive process- while it does not eliminate all enzymes, it does significantly reduce the number left after processing. Regardless, while nutrition is essential to our overall health, it has no role in veganism as an ethical philosophy. After all, how many times have we heard that eating animals is vital for good health? Hundreds? Thousands? Plenty. A 2007 study from Penn State College of Medicine of 139 children found that buckwheat honey outperformed the cough suppressant, dextromethorphan (DM) in calming nighttime coughs and improving their sleep. Honey isn’t the only bee-derived food that has purported health claims, here are the three most common foods and their alleged benefits. Bee pollen products have a long laundry list of purported health benefits, but these claims are without reliable scientific evidence of efficacy. Royal jelly is the food meant for the queen bee. A wide variety of health and beauty benefits have been attributed to royal jelly over the years yet, like bee pollen, there are no medical studies that have definitively demonstrated therapeutic effects for royal jelly. Humans could not survive a world without animal-pollinated plants, making saving pollinators an absolute necessity. Bees are well-known as pollinators, but they aren’t alone. Other pollinators include birds, butterflies, ants, and even bats, among other small mammals. Animal pollinators are responsible for pollinating one-third of our crops and of that one-third, bees pollinate roughly 75% of it. Pollinators have an essential role in sustaining our ecosystem and produce natural resources by helping the plants reproduce. Without the actions of pollinators, our food supply and surrounding landscapes would collapse. Here are six ways you can help native pollinators not only survive, but thrive. Habitat loss is threatening the lives of bees around the world. From monoculture-based agriculture to perfectly manicured lawns in neighborhoods, native landscapes vital to bees are disappearing. Rethink your lawn. Replace all or part of your lawn grass with flowering plants. Doing so will provide food and habitat. Plant native flowers. Native flowers help feed bees and are uniquely adapted to your region. Here’s a list of plants pollinators love. Choose single flower tops. Double-headed flowers produce much less nectar and make it difficult for bees to access the pollen. Steer clear of hybridized plants. These are plants that have been bred not to seed, and they produce very little pollen for bees. Plan for year-round blooming. 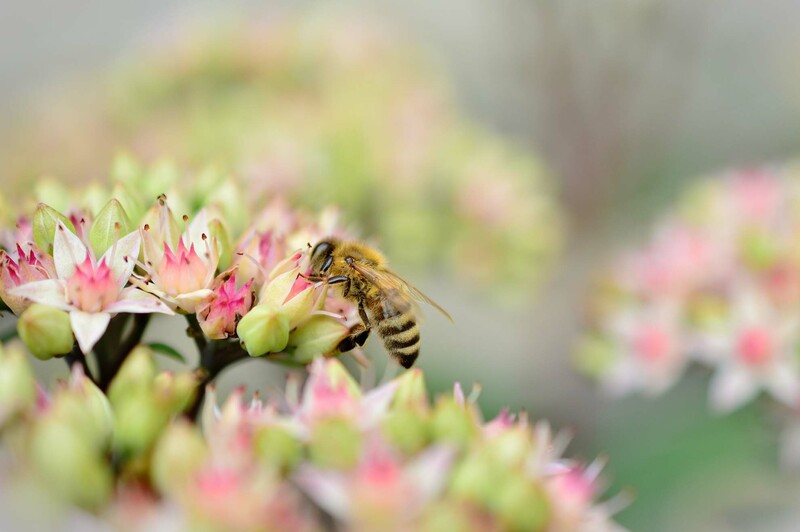 Plant at least three different types of blooming flowers to ensure flowers through as many seasons as possible to provide bees with a constant source of food. Weeds can be a good thing. Wildflowers, many of which some might classify as weeds like clover and dandelions, are not only some of the most critical food sources for native North American bees but to other native pollinators as well. Letting your landscape flower is better for the pollinators and your back. If you have limited space, try to add a flower box or a container garden with flowering plants to create an inviting oasis that will help with foraging. Native bees like to burrow. Leaving a patch of the garden or area in the lawn uncultivated in a sunny area will encourage this behavior. Bees also need a place to get fresh, clean water. 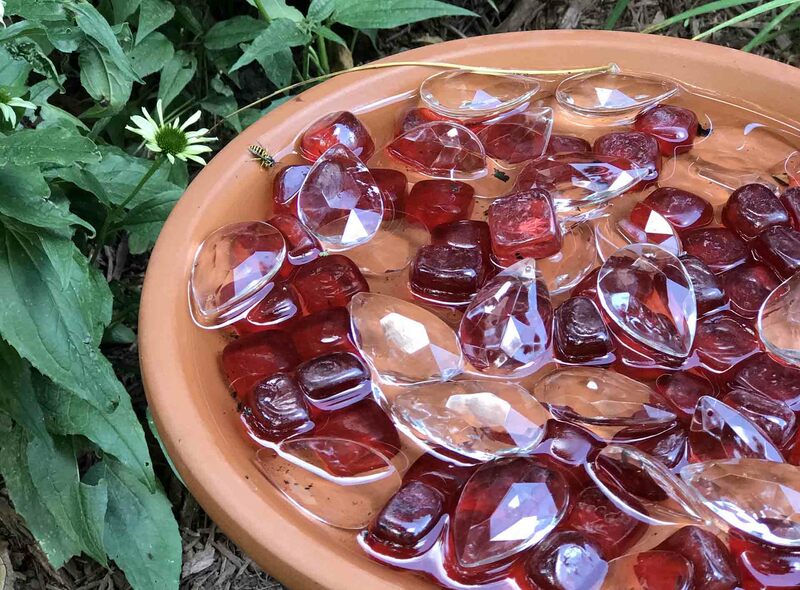 Fill a shallow container of water with pebbles or twigs for the bees to land on while drinking- such as a birdbath with some stones on the bottom. It’s important to remember to maintain the water supply to ensure that the bees know they can return to the same spot every day. Avoid using herbicides or pesticides in the garden. The treatments you put on your lawn or garden can not only be toxic to bees, but also to the humans and other animals who visit. These treatments are especially damaging if applied while the flowers are in bloom because the chemical will get into the pollen and nectar. The bee collects the contaminated nectar and pollen and takes it back to the hive where it gets into the honey- which can then be passed on to humans if they consume the honey. Ladybugs, spiders, and praying mantises will naturally keep the garden populations in check. Buying organic food means no pesticides, buying local food also means eating seasonally which can help you avoid foods that come from monoculture crops. Buy produce from a local farmer’s market or co-op or a Community Supported Agriculture Farm. Of all the actions on this list, this one might be the easiest to do. Or, not do as in this case. Having no lawn is best, but if you do have one, mow it less often. Mowing every two to three gives insects and other pollinators an opportunity to forage on flowering plants before they disappear again. There are many different ways to be a voice for pollinators. You may, in researching this topic, read that one way to help bees is by purchasing honey and other bee products from small, local farmers. Instead, I’m suggesting we do something different. A cleaner hive, a bigger hive, a hive fed honey instead of high fructose corn syrup, a colony free from antibiotics, or queens who aren’t artificially inseminated; these are things that all bees deserve, no question. But they also deserve a life free from human obligation. The catastrophic disappearance of honeybees is an ecological crisis that threatens to bring global agriculture to a standstill. 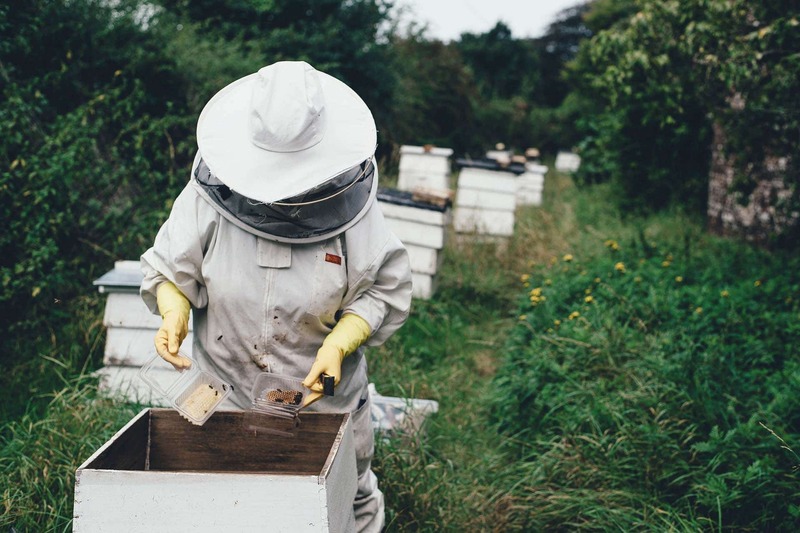 Take a further look at our current agricultural landscape and the mysterious world of the beehive through documentaries and films about bees. Find several films that document this crisis by visiting Vegan Flicks. Good news! Finding vegan alternatives for honey and other bee products is a snap! There are plenty of vegan alternatives to help satisfy any sweep syrup craving you may have. While some are more like honey than others, all of them come from plants. Agave Nectar: A sweetener commercially produced from several species of the agave plant. Agave is sweeter than honey and tends to be less viscous. Like honey, it comes in a varietal of styles ranging from dark amber to light, each with their distinct flavor. Barley Malt Syrup: A malt-likey syrup comes from sprouted barley, roasted and cooked down to a syrup. Brown Rice Syrup: A sweetener made by exposing cooked rice to enzymes that break down the starches and turn them into smaller sugars. Then all the “impurities” are filtered out, and all that is left is a thick dark syrup with a caramel type flavor. Coconut Nectar: Nectar made from the reduced sap of coconut palms, has a sweet, tangy, taste with no coconut flavor. It is high in amino acids, vitamins, and minerals. It’s also is low-glycemic. Maple Syrup: This pancake staple comes from the sap of sugar maple, red maple, or black maple trees. Molasses: Molasses comes from refining sugarcane or sugar beets into sugar. Like other plant syrups, molasses has several varieties and flavors. This list contains affiliate links; I will be compensated if you make a purchase after clicking on my links. Thank you for the support. Read my full affiliate disclosure. To make date paste, place Medjool dates into a bowl. Pour hot water directly over top. Let them soak for an hour or more. Blend well in a high-speed blender like a Vitamix or BlendTec, or food processor until smooth. The end flavor is similar to caramel. “It’s none of your beeswax!” is a phrase I would frequently use as a six-year-old child wanting to keep a secret, and I find that my meaning then still applies today, “it’s not yours, you can’t have it.” Back then I was using beeswax to mean business, today I mean it more literally; let’s leave the wax to the bees. There are plenty of great alternatives. Candelilla wax is the exudate found on the leaves of a small shrub native to Mexico and the southwest. It is softer than Carnauba wax and is often used to make candles. You’ll spot candelilla wax in lip balms, lipsticks, body butter, creams, lotions, pomades, and other products. If you are anything like me, you love a good lip balm. Dry, chapped lips are not only uncomfortable, but they can also be the sign of an underlying illness or condition you may not know about such as dehydration, vitamin deficiency, or more a more severe disease. Luckily, applying lip balm can help cure some of the more common causes of chapped lips and can even prevent chapped lips from occurring. 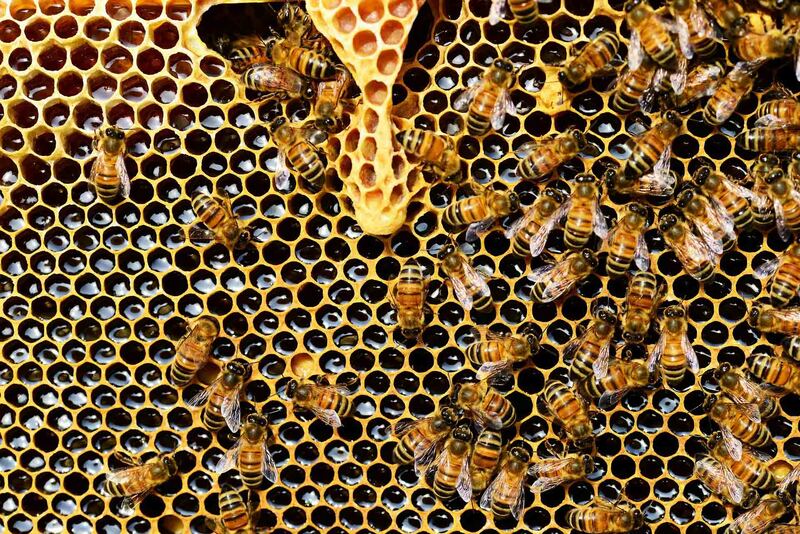 One of the most common ingredients in the lip balm is beeswax. Since vegans avoid beeswax, you’ll want to look for lip balms made with pure essential oils mixed with candelilla, carnauba, or hemp wax. Check out Merry Hempsters Lip Balm, Hurraw! Lip Balm, or my personal favorite, Crazy Rumors Lip Balm. They’re made with natural, vegan ingredients and will help keep those kissers kissable. Of all of the stereotypes that vegans face daily, the following one might be the most irritating. According to some, those who remain steadfast in their vegan convictions are putting personal purity ahead of being an effective advocate. They believe that every action harms some animals, so worrying about minutia animal ingredients in food is anti-vegan because it could potentially scare away a non-vegan from attempting to live vegan. This is ridiculous and doesn’t give people enough credit. Worse, it’s faulty information and only ends up confusing people who are unfamiliar with what veganism is. Telling people that vegans shouldn’t worry about consuming animal products is incredibly misleading. There are so many animal products that we can’t avoid such as medications, building materials in homes, cars, or laptops, for example. Our world is a mostly non-vegan one; the very least vegans can do is avoid every animal product possible. Honey and bee products are solidly on this list. Veganism is not about perfection or purity. No one alive is perfect, vegans included. Having a definition for the largest social justice movement since the abolition of slavery has nothing whatsoever to do with perfection. It has everything to do with advocating with a clear and consistent message. Don’t let this discourage you. Failure isn’t an end, but a part of the process of life. You are going to read articles that talk about how you should never make veganism look difficult by asking if there are animal ingredients in your food at restaurants, or how you shouldn’t hurt the feelings of well-intentioned people by declining a non-vegan food at a family gathering. You’re going to read that perfection and personal purity is antithetical to the general goal of animal liberation: Less suffering. Veganism as an ethical philosophy is not about reducing suffering at all. Veganism is about life, and it is about death. I’m not trying to be melodramatic; it’s the truth. Our choices either spare lives or they take them. Do vegans want to reduce the suffering of all animals? Yes, of course, but through freedom and autonomy, not bigger cages or humane deaths. Does this mean you can’t start your journey in stages or use the non-vegan items you already own until their useful life is over? Not at all. What it does mean is that we should be living with intention and saving as many animals as possible. Removing animal products from your life isn’t hard, it just takes a little practice. The best way to inspire people is through honest, open, and respectful dialogue followed up with living by example. As vegans, we should never consider setting aside vegan ethics to appease someone else, no matter who they may be. If it’s someone you love, they’ll understand and respect you. If it’s someone you don’t, you’ll gain more respect living your convictions rather than conforming to what the mainstream has decided is normal. If you set aside your vegan ethics for convenience, other people will too. You don’t have to hide your veganism, saving lives is nothing to be ashamed of. Be who you are, unapologetically. You are changing the world for animals. This is necessary and important work. You can advocate quietly or loudly; it doesn’t matter. Just continue to advocate without setting your ethics aside. People might tell you, “a little bit of animal products won’t kill you,” and they’re right. Consuming some animal products won’t kill you, but it will kill animals. Avoiding honey or bee products is consistent with veganism as an ethical philosophy because a bee is an animal; it has nothing to do with perfection or personal purity. As vegans, we cannot ignore the ethical implications and environmental consequences of the bee husbandry industry, and doing so reduces our credibility as a serious movement trying to affect change. Honey isn’t some magical ingredient no one can avoid. It’s an animal product that has been mass marketed and mass manufactured for generations, and it’s been tested on animals. With so many vegan alternatives available, honey is not only exploitative, it’s unnecessary. Thanks so much for your article. I became vegan one month ago, literally in the middle of a meaty meal when I was suddenly overwhelmed and disgusted and couldn’t continue. At that time, I collected all animal food products in my home (not too many, really, since I’m allergic to milk — I am impervious to the “but what about CHEESE? ?” argument) and gave them to a meat-eating neighbor. I did, however, keep my honey. I had heard arguments in favor of vegans eating honey, most notably that the cultivation of honey supports bees simply by nature of making them a necessary animal. Your article makes so much more sense. Today I’ll be giving away my honey. I also want to thank you for your gentle and accepting perspective on using up the non-vegan products we already have when we become vegan. Replacing all of my shoes and cosmetics that are not vegan would cost thousands of dollars. Identifying as a vegan now, I feel hypocritical when I wear leather shoes or use eyeliner that I know contains carmine. You’ve taken the sting out of that; vegan is not a diet; it’s a belief system and a lifestyle, and it’ll take time to fully embrace it and make my entire life vegan-friendly. Thank you for a well laid out discussion. Not that I will use honey half as much as I have been. I just read how much one bee produces. That fact alone, 1/12 of a teaspoon per bee lifespan, did more to curb my consumption than all of your above arguments. Why? Because Homo sapiens are wrecking havoc on pollinators with things WAY more damaging to ALL species than eating a bit of home-hived honey (meaning a hive a person has kept for their own personal use, and nothing more). Your webpage is well done, I thank you for that. Seriously, I felt that reading (on another page) that one bee only produces 1/12 of a teaspoon of honey in its lifetime was more impactful than all of your well laid out writing. But then, I grew up around animals, and understand their perspective better than so called humans. I have always respected bees, and always will. I have always tried to offer a wide range of garden so as to support as many pollinators as possible. I will continue to do so. I will also continue to crusade against Round-up, GMO, and Homo sapien overpopulation. Sadly, overpopulation causes all other ‘vegan’ arguments to feel moot. The biggest and best solution to industrialized food? Get the population of our species back under control! Thank you again for a well laid out discussion!!! You helped me shift my position on honey closer to ‘vegan’! However, even if I never use another drop of honey- I still only call myself an herbivore. Until overpopulation of our species ceases, there is no such thing as “do no harm”. Overpopulation is doing harm, constantly. Great resource. Good explains the ins and outs of the honey cultivation process and explores the Great Honey Debate in detail. By that thought process, why use anything? Why not Live in a cave on a mountain and wait patiently for death. By your process, how dare you step on grass, eat grains, wear clothing? It was all made from something that was once alive. Farming whether it is raising wheat or lambs is the same, each taking something alive and growing it for consumption. So the stuff they do to plants is ok, but what we do to bees is criminal? Where does it end?